The Jim Wright recreation of the Hughes Racer is a well documented story. At an estimated 35,000 hours of building time and $1 million in development cost, it can be said that this is the most famous experimental aircraft ever built. He and his team painstakingly created a replica of Howard Hughes H-1 Racer without the aid of any plans or top level drawings. 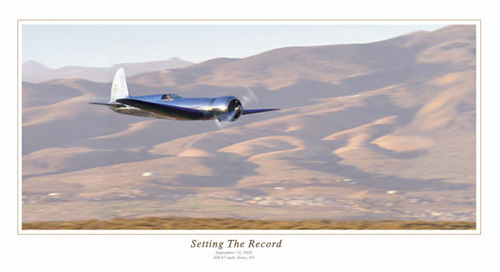 On September 13, 2002 it set a new world speed record (category C-1.d) of 304.07 mph at the Reno Stead Airport. This painting depicts Jim on his record setting run.